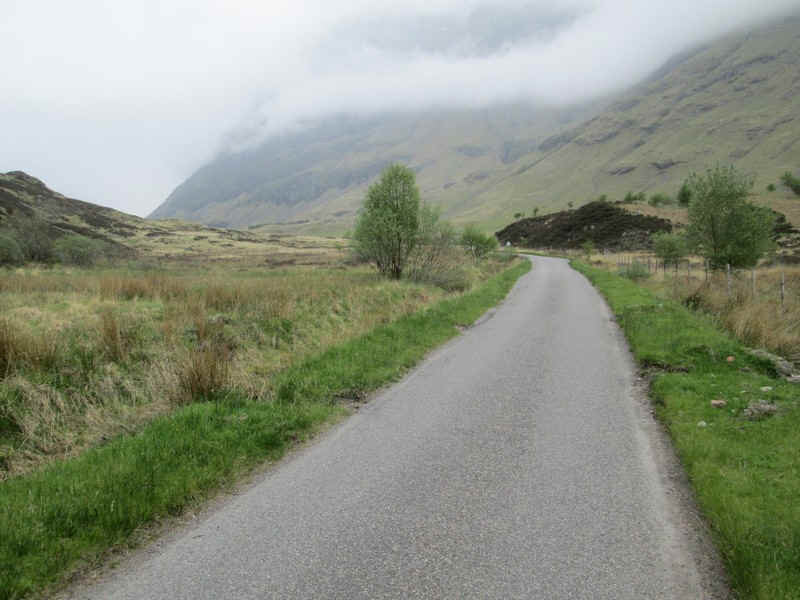 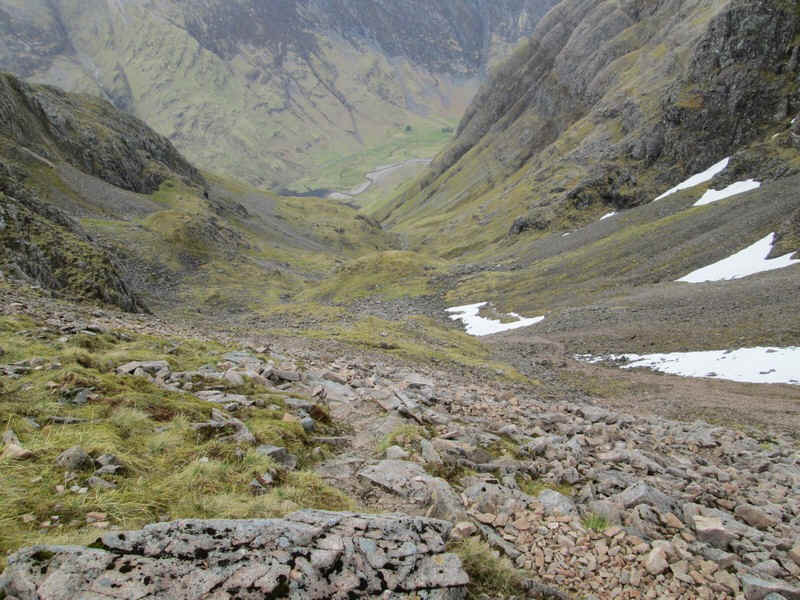 Having spent the night at the Clachaig Inn the day's objective was to climb Bidean nam Bian, at 1150 metres the highest peak in Glen Coe. 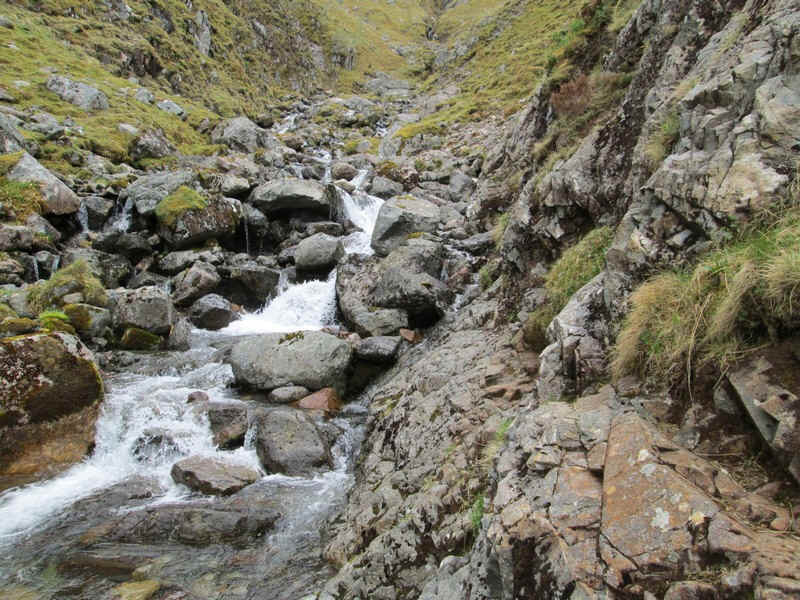 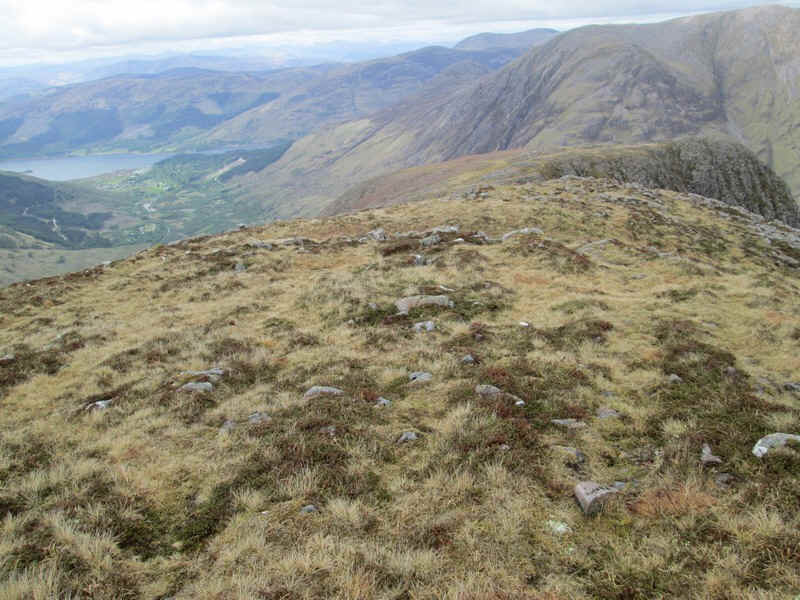 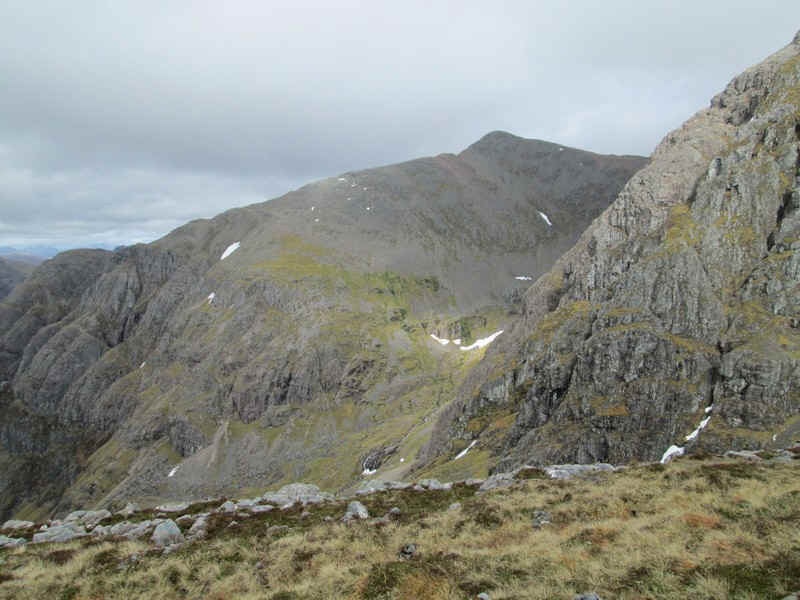 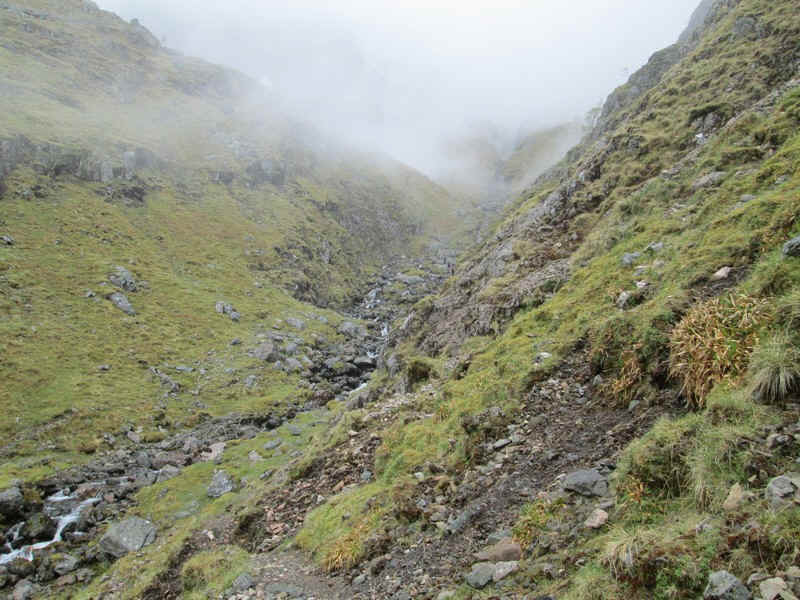 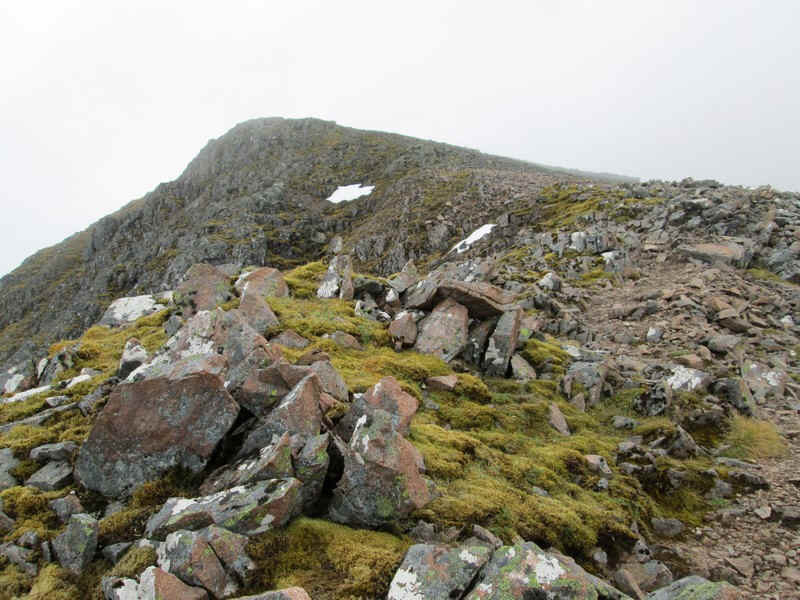 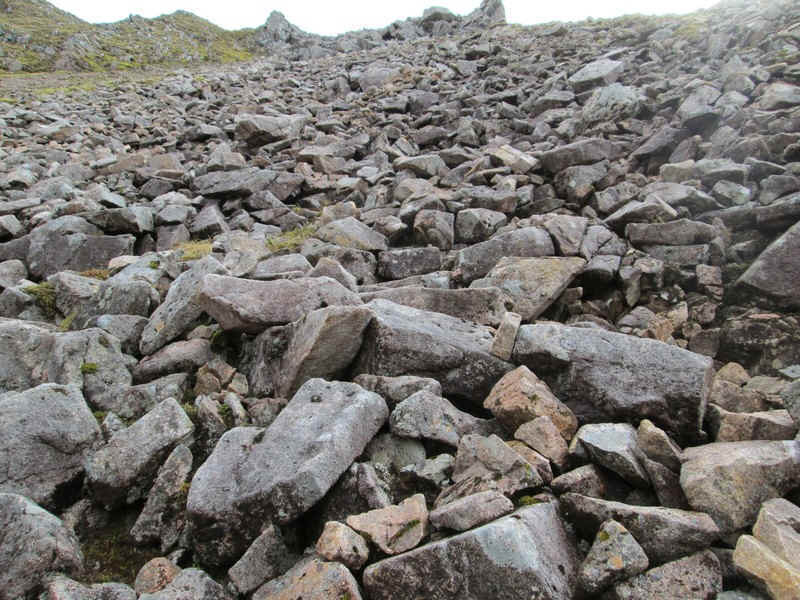 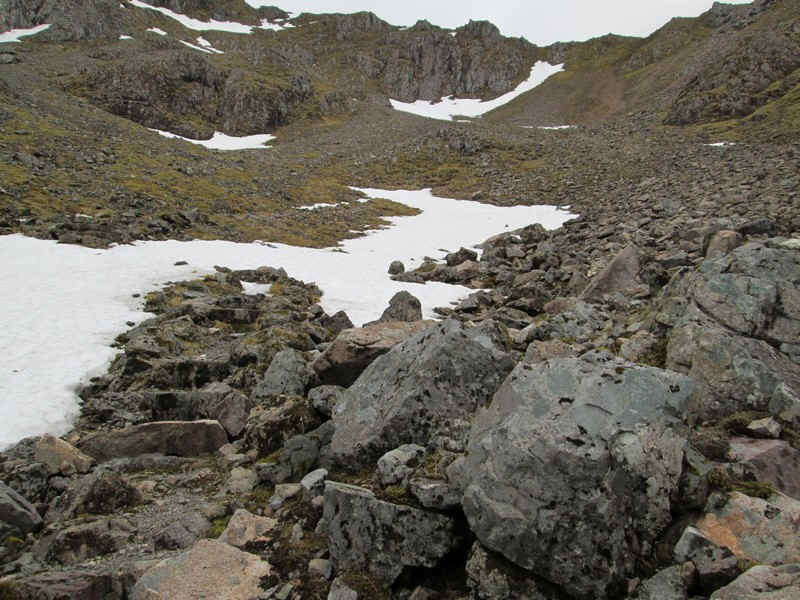 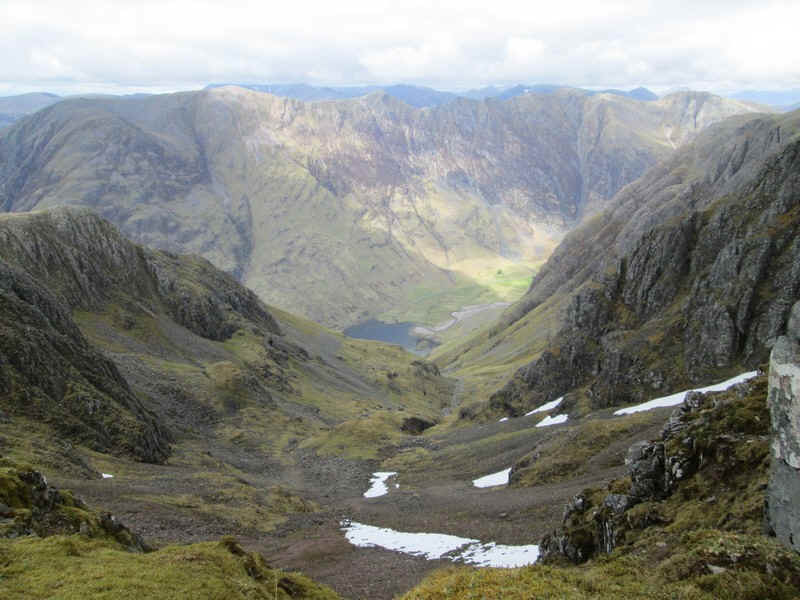 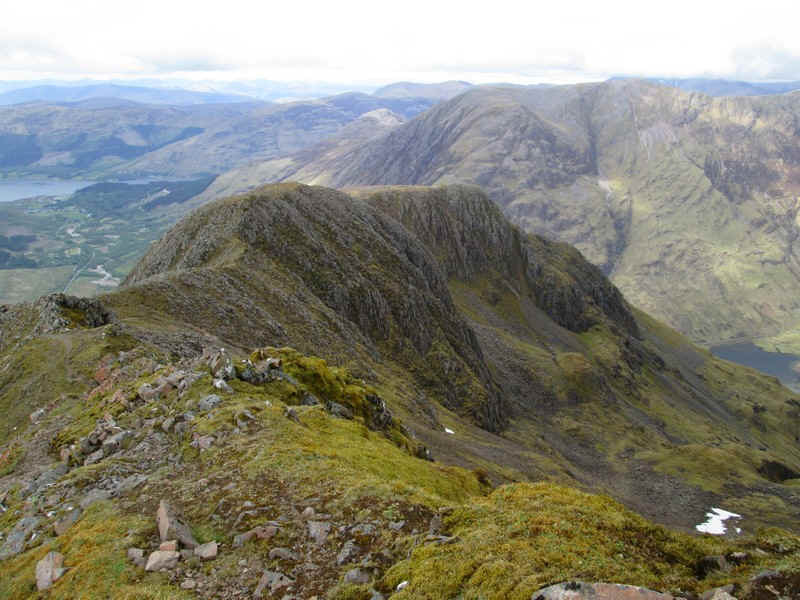 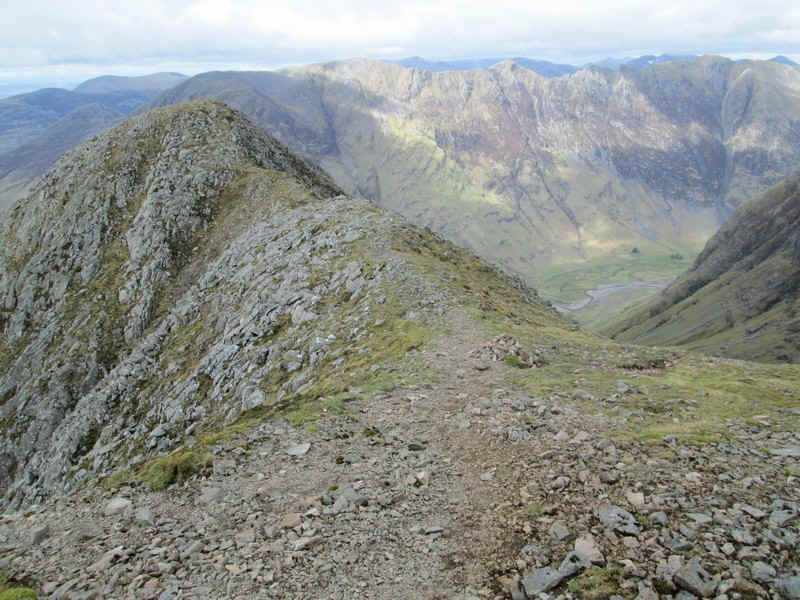 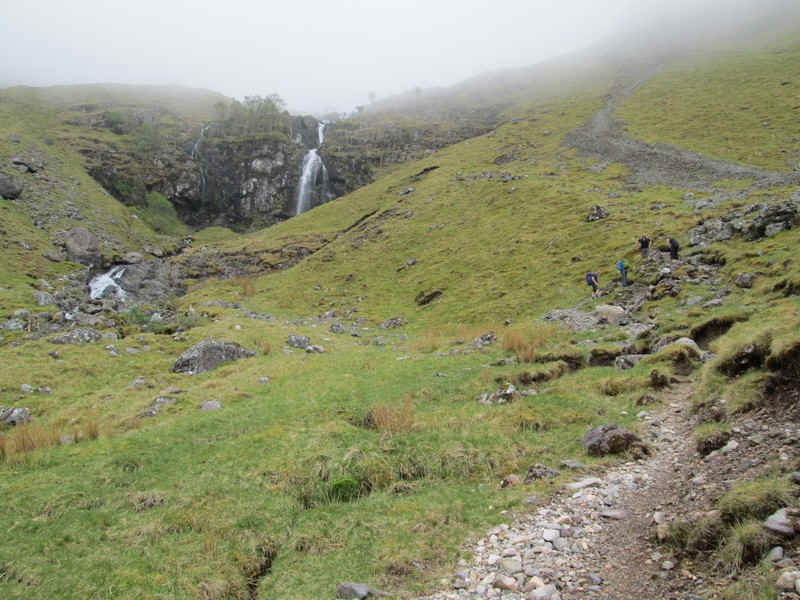 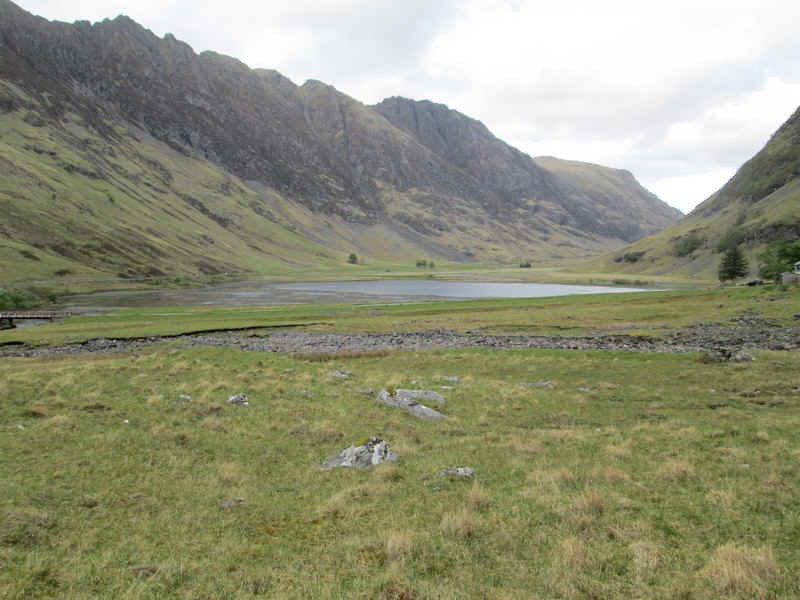 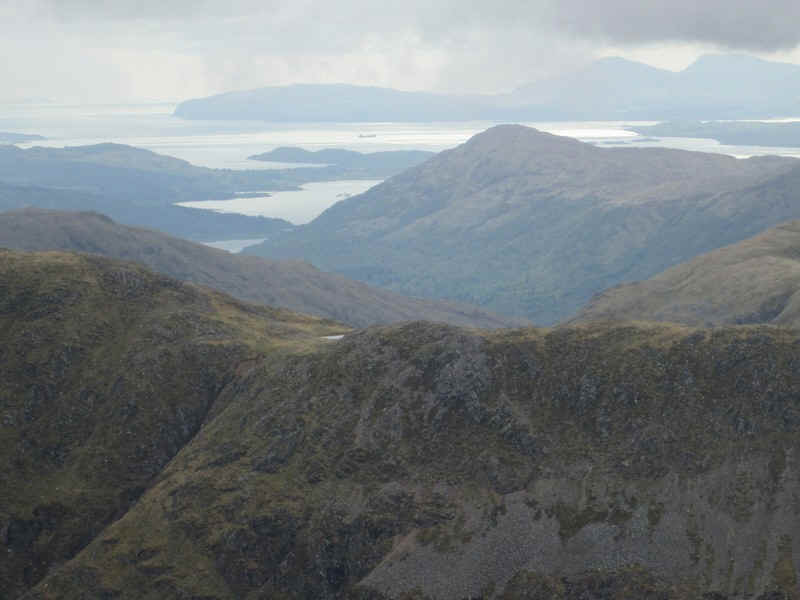 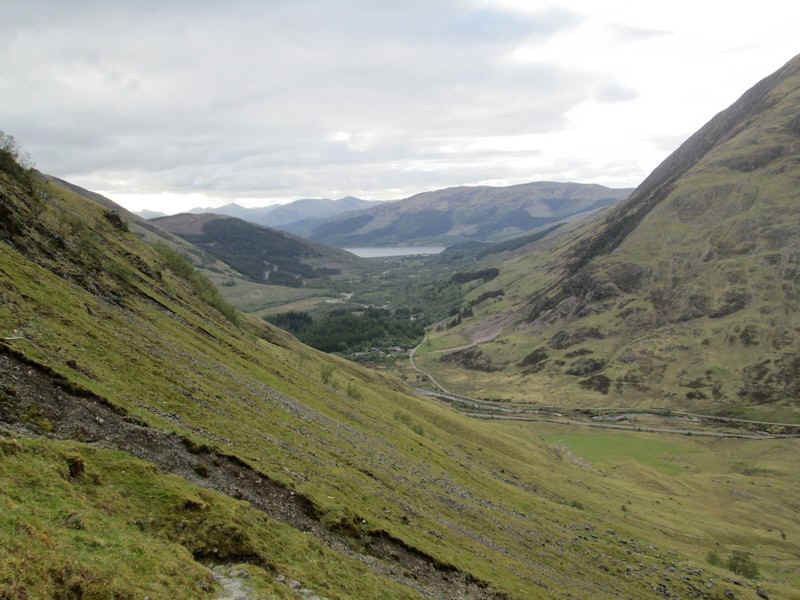 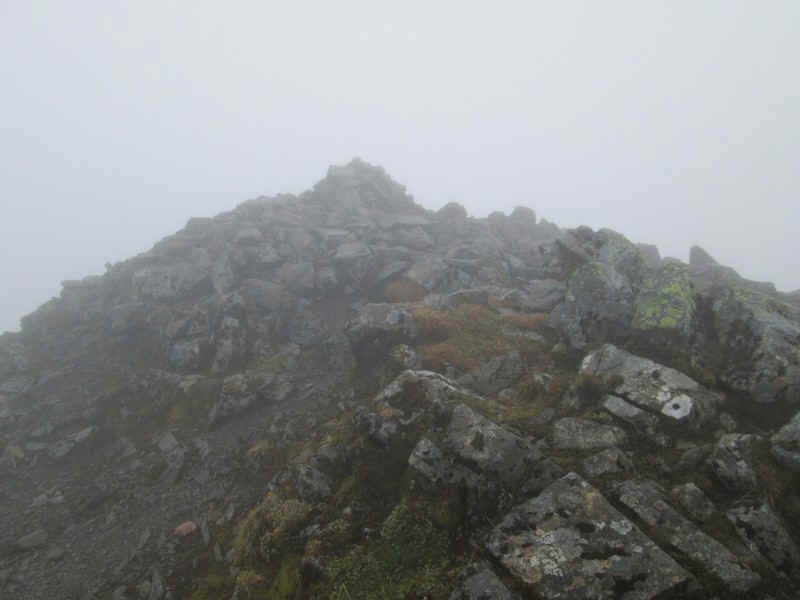 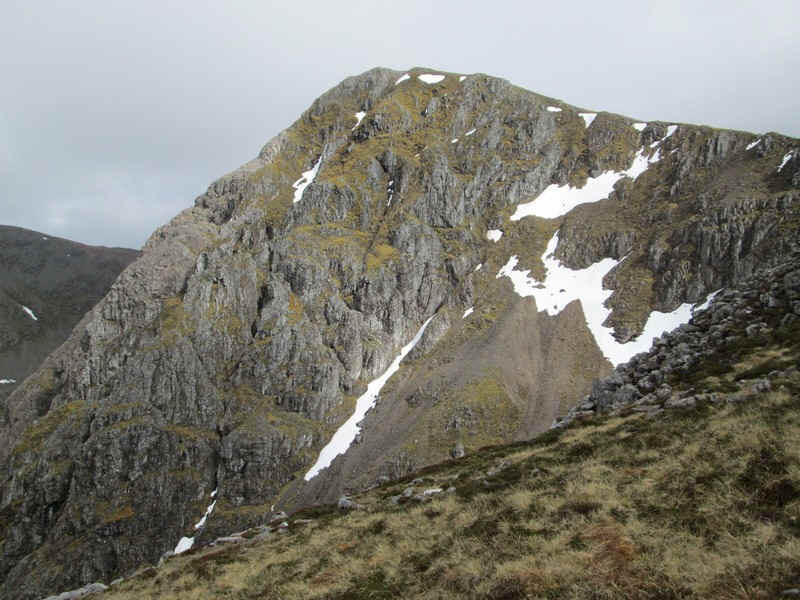 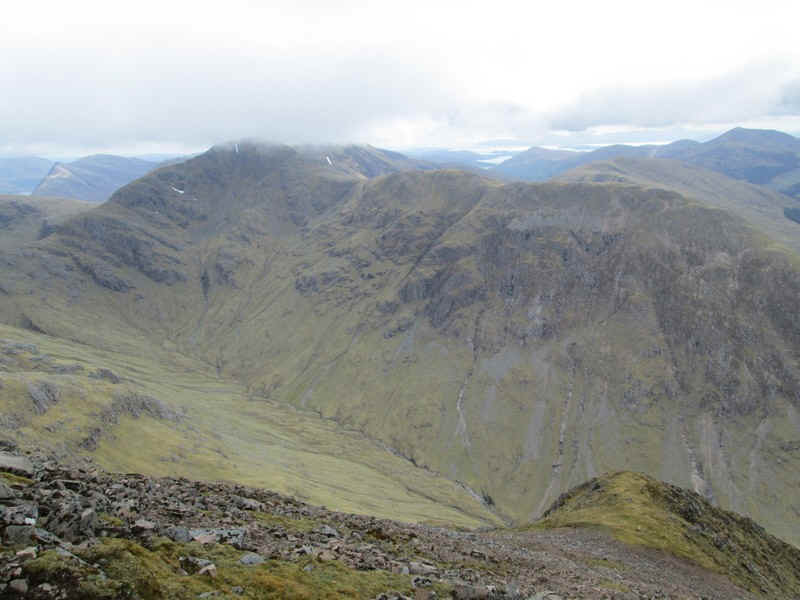 I also hoped to be able to continue on to the second Munro of Stob Coire Sgreamhach. 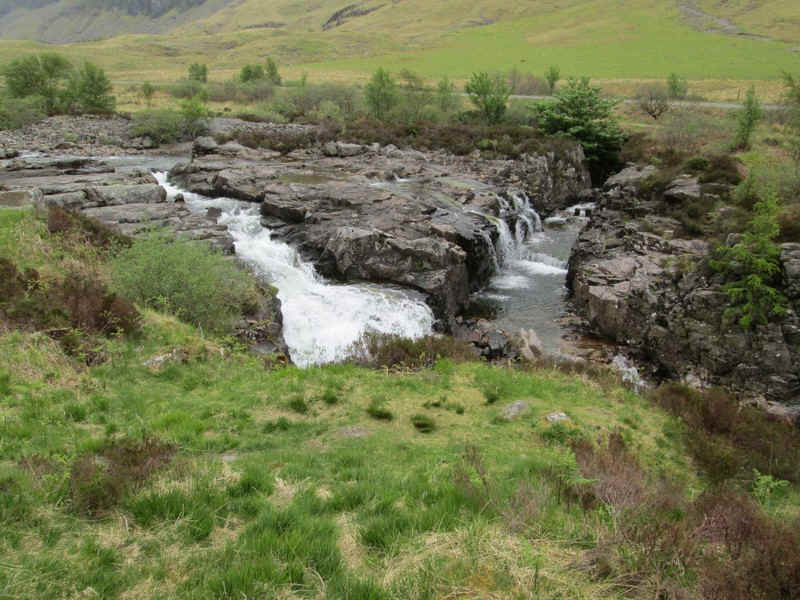 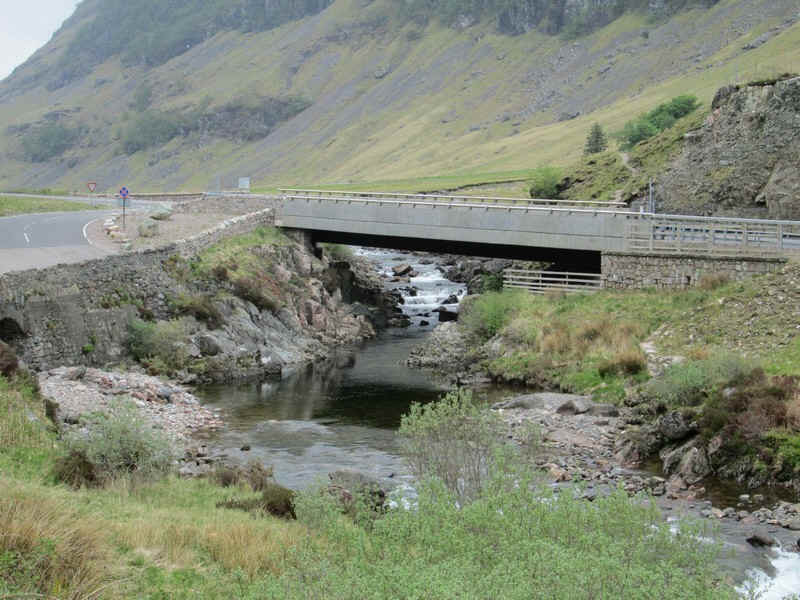 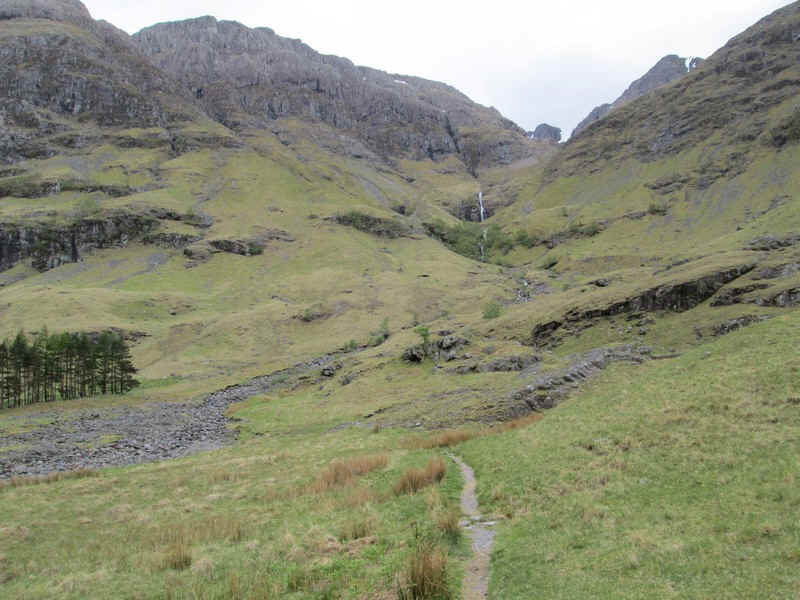 ....past these cascades in the River Coe. 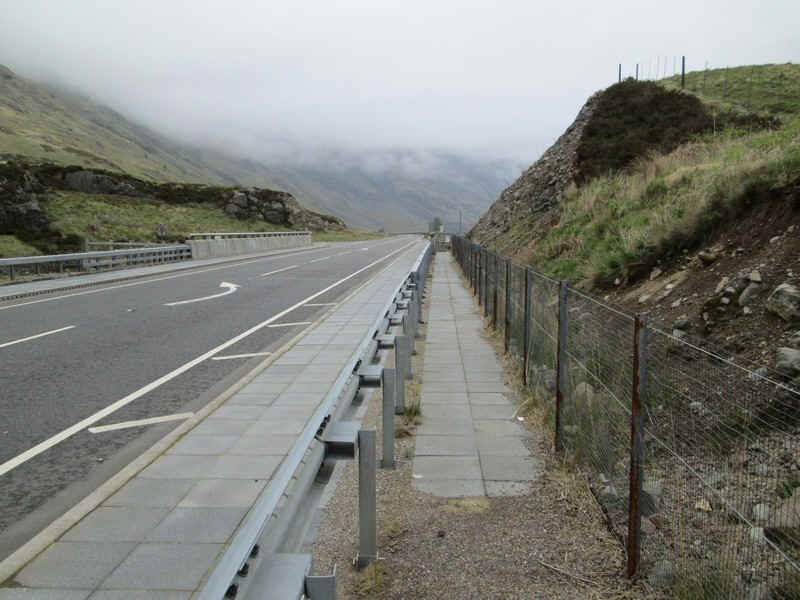 .....where the hill path goes behind the crash barrier to a gate. 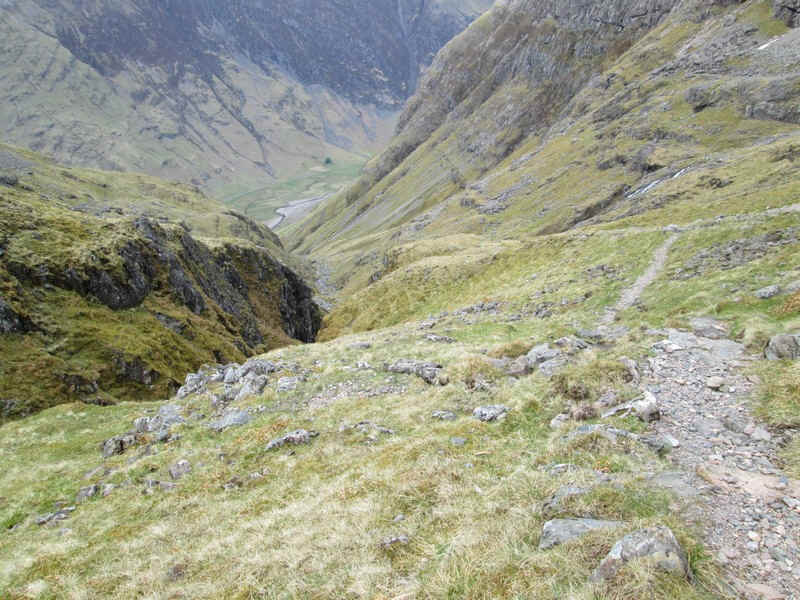 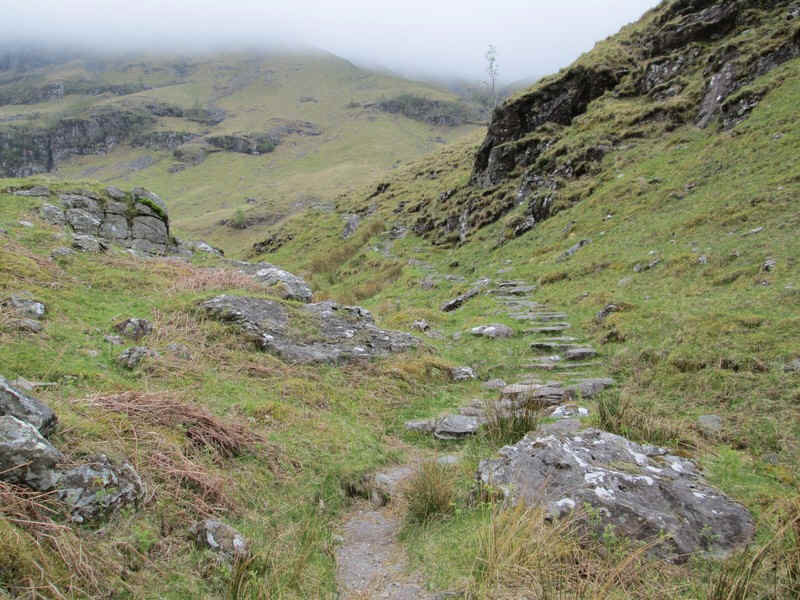 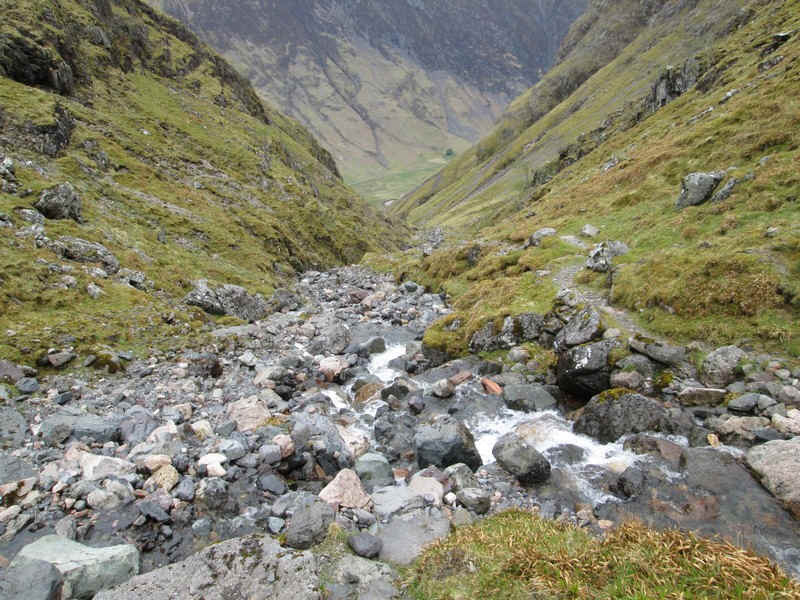 The path leads directly onto the hillside - no long walk in on this walk! 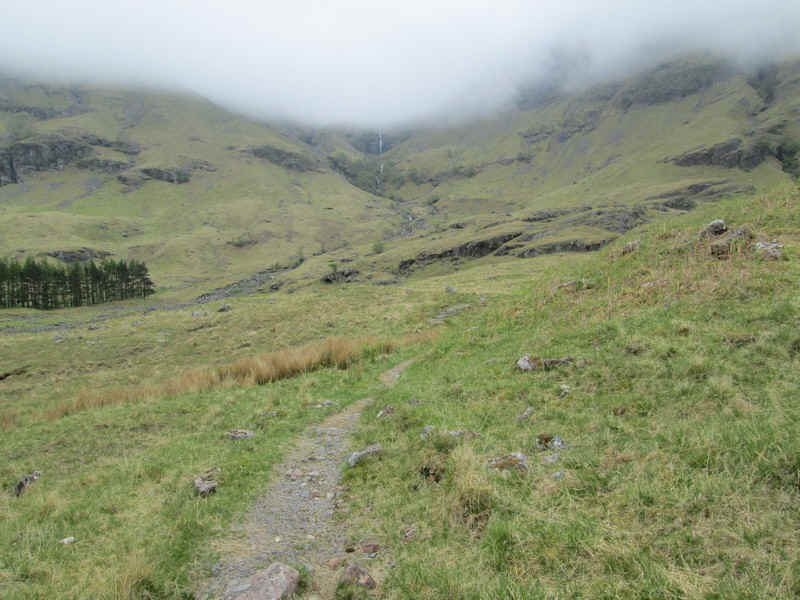 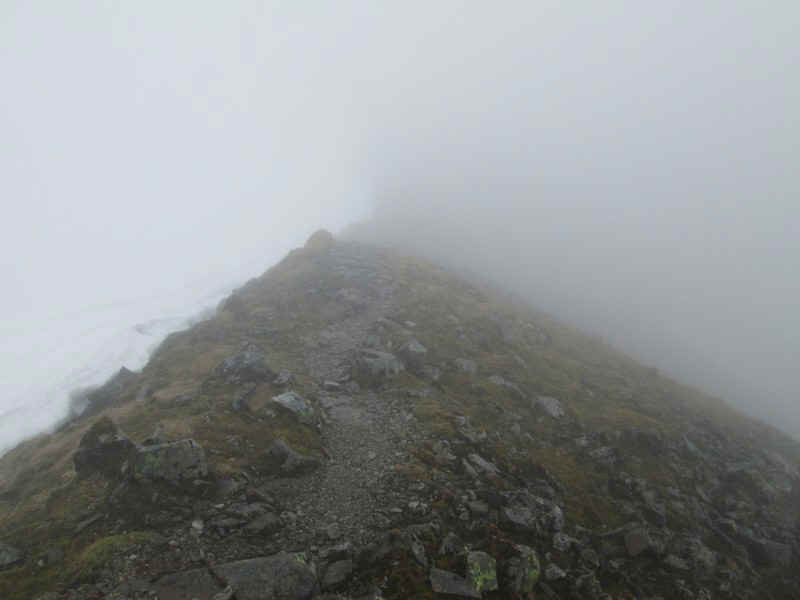 From this point I've decided to include photos taken on both the uphill and downhill walk to illustrate the route as low cloud on the way uphill made photography pointless. 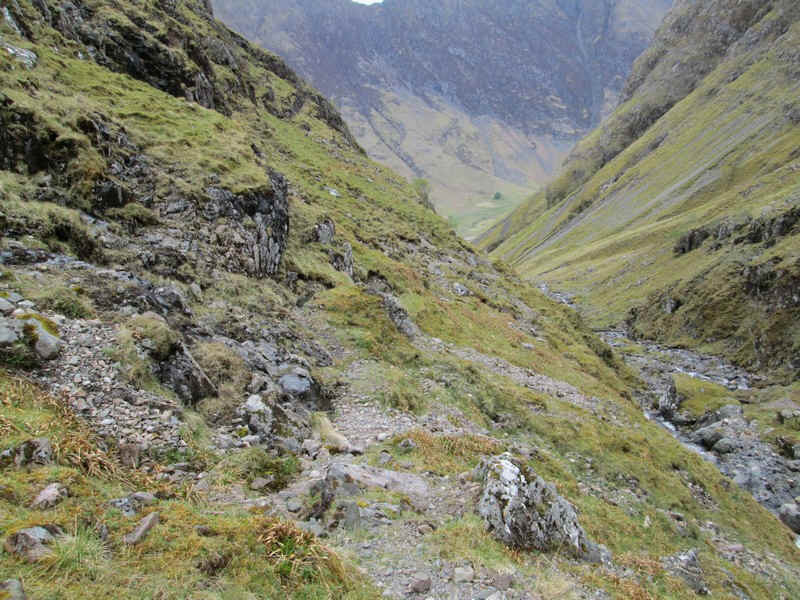 I've used (up) and (down) after the captions to clarify when the photo was taken. 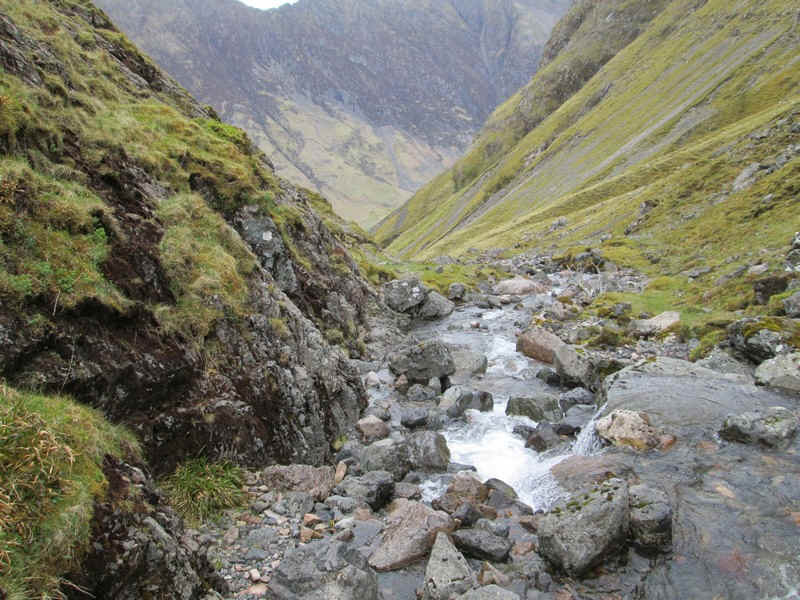 Try to cross the stream and work up the far bank, knowing I'd have to cross back again higher up. 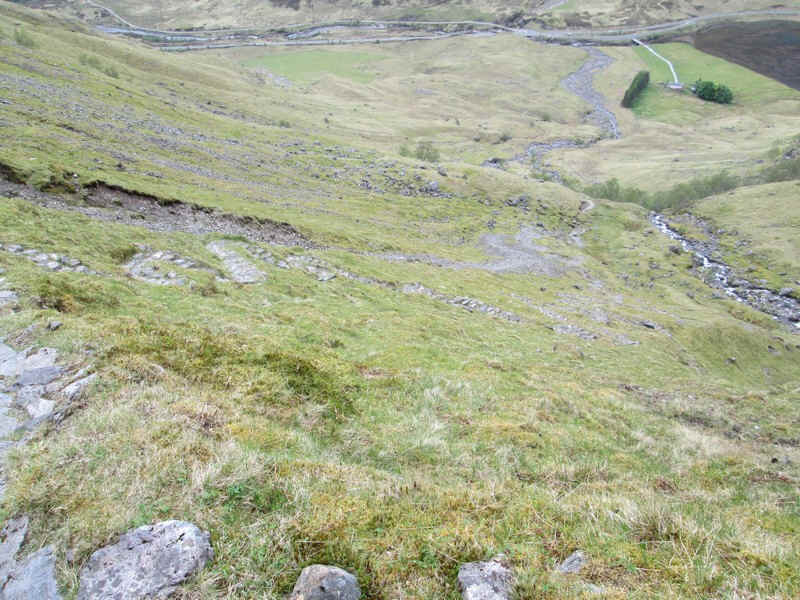 Scramble along the damp rock at the bottom - given that there didn't seem to be any decent hand/ feet holds that didn't look to be too appealing. 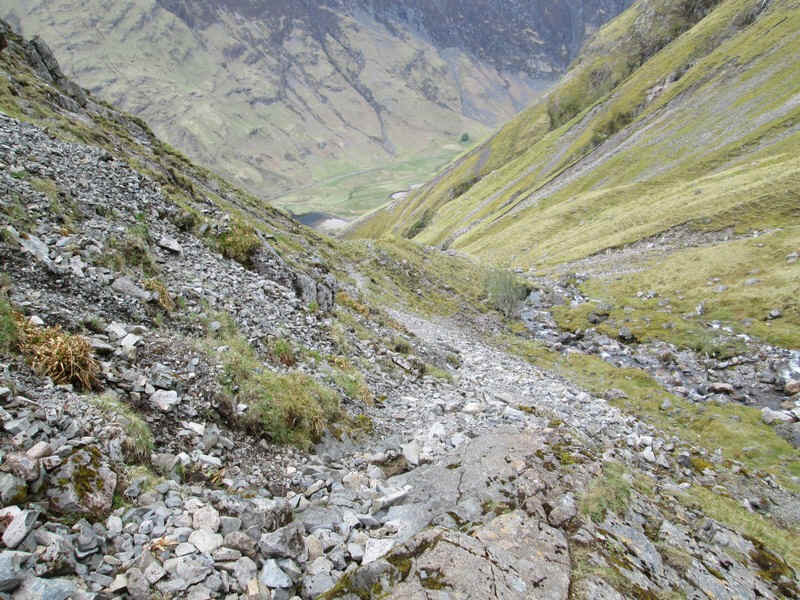 Try to find a way forward by climbing up the hillside and work around the obstacle. 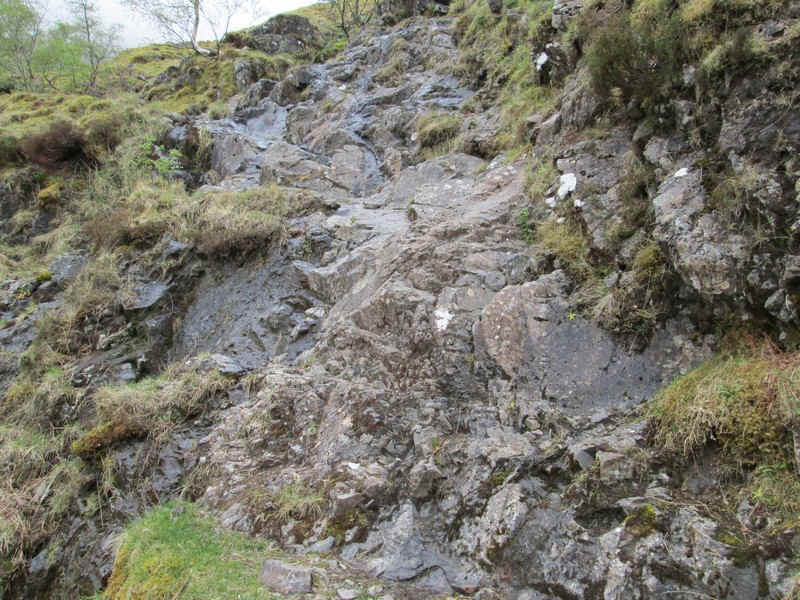 This was what I did although it took a surprising amount of time to do this safely. 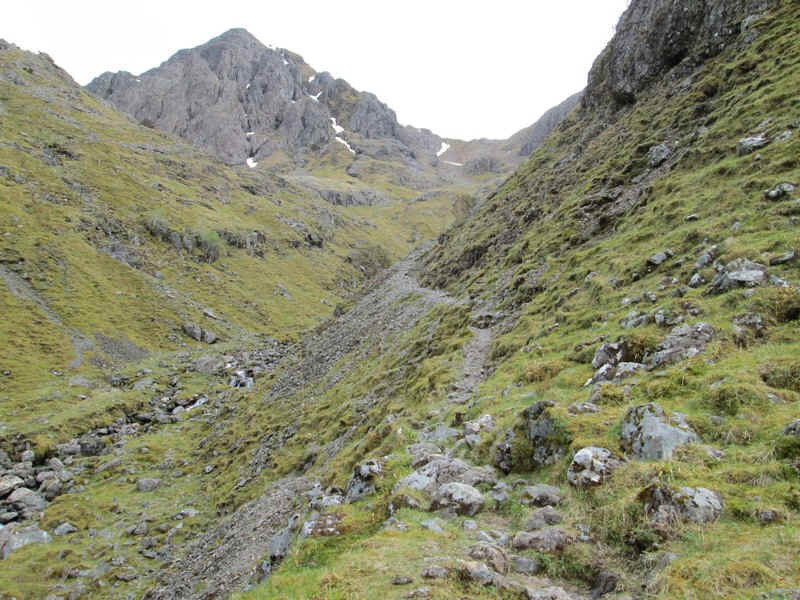 Given the amount of time and cost that has been spent on this path both before and after the ravine, I'm surprised that no attempt has been made to construct a path around this section, possibly up the hillside. 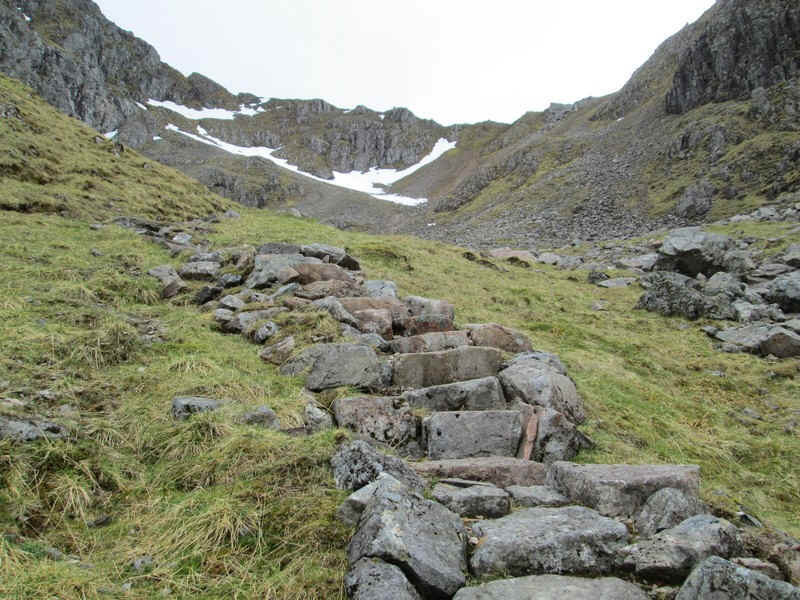 Clearly a lot of effort has gone into this path..
Amazingly, there is an absolutely clear track through the rubble.. 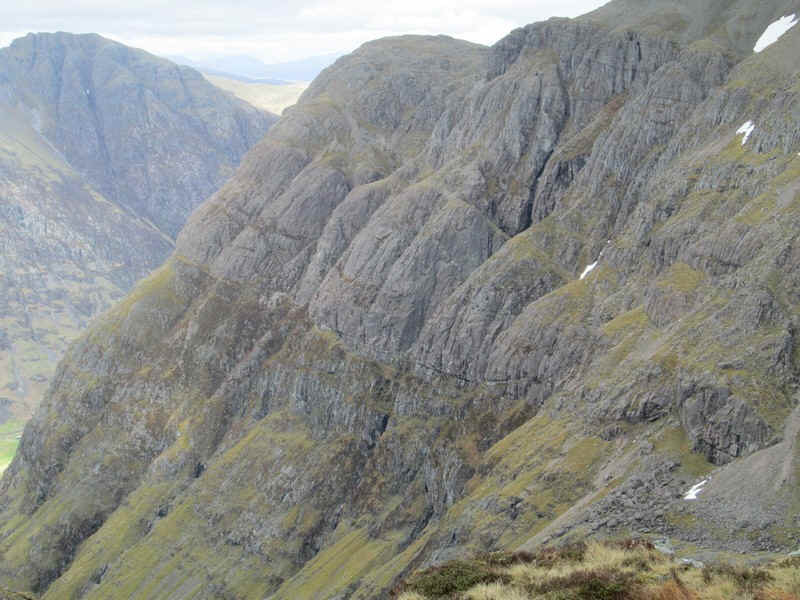 The cliffs on the side of this mountain have some interesting horizontal fissures. 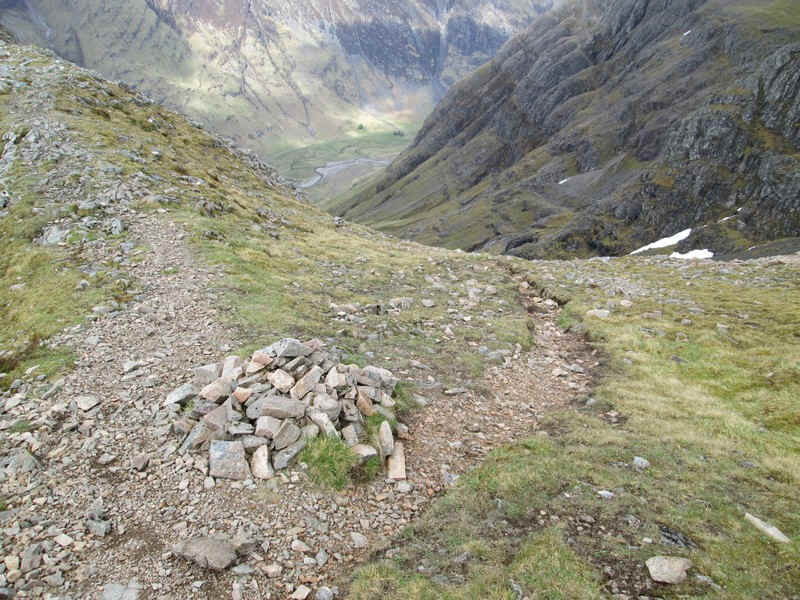 The path junction at bealach is marked by a small cairn. 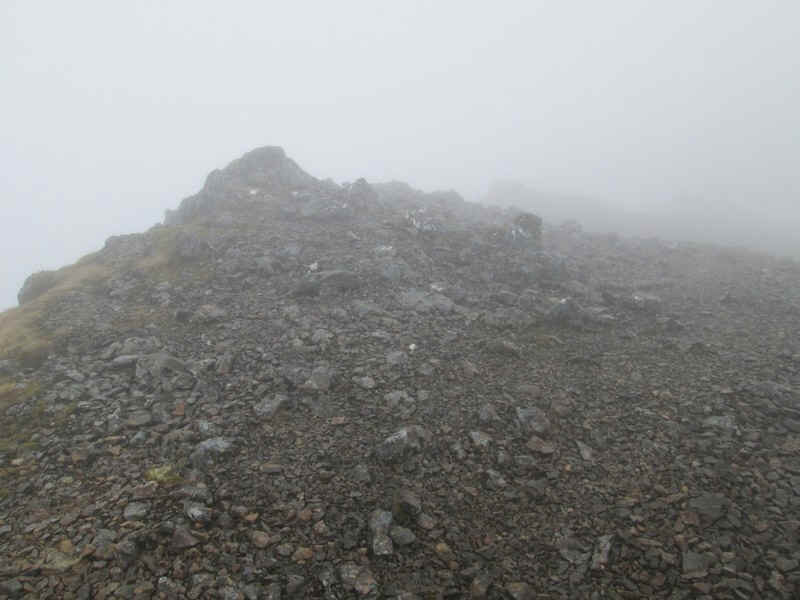 Having resigned myself to no views it was delightful when as I dropped down from the summit of Stob Coire nam Beith the clouds lifted slightly giving some extensive views. 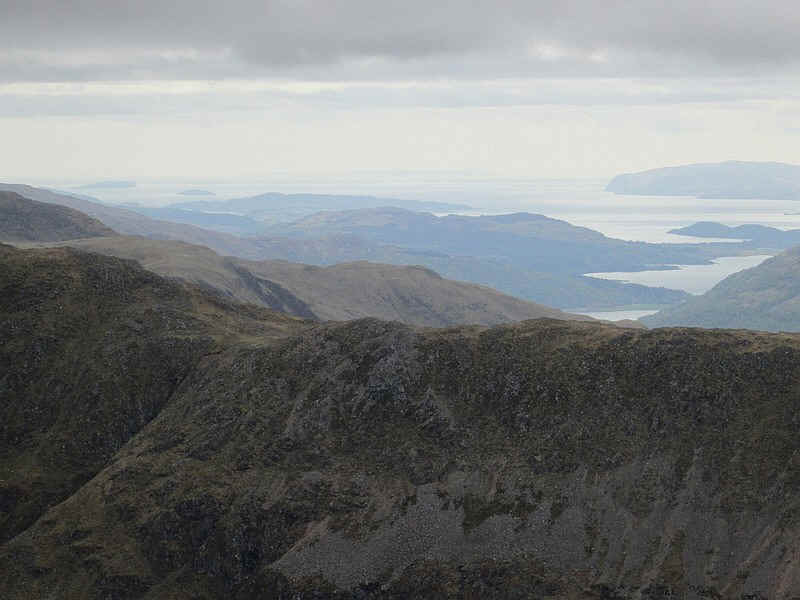 Just visible on the horizon is the island of Colonsay with Lismore in the centre, whilst the cliffs at the south of Mull are clearly visible.